Sabine Wüsthoff regularly holds seminars for choir leaders and conductors. 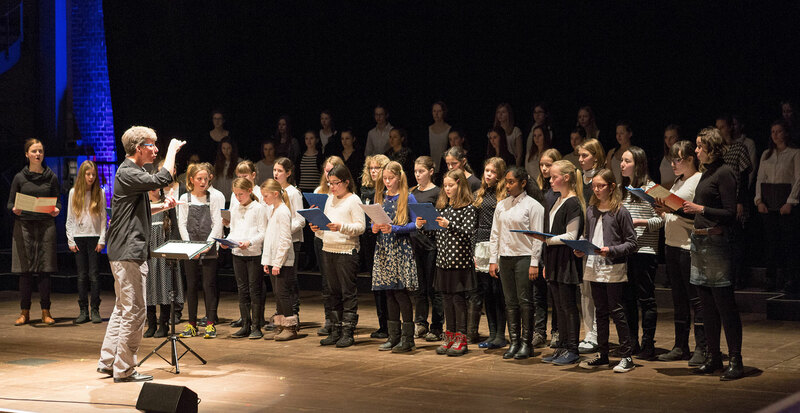 In workshops and intensive seminars for youth choral conducting, i. e. at the vocal festival Chor@Berlin, the Berlin Girls Choir also gets into action as choir to practice with by the participants of these seminars. The Chief conductors of the Berlin Girls Choir and the Girls Choir of the Sing-Akademie Berlin, Sabine Wüsthoff and Prof. Friederike Stahmer, as well as Gudrun Gierzal, back then conductor of the Basic Choir and today employee at the Sing-Akademie, joined their forces in 2011 to learn from each other for their common work. In this unique cooperation, the three women weigh in their broad knowledge: Stahmer, professor at the University of Music Hannover, is a specialist for voice training. Gierszal, lecturer at the University of Arts Berlin, is specialist for music theory for children and a freelance composer. Conductor Wüsthoff has been an artistic director with special experience in working with girls and young women for many years. The high artistic claim and the endeavour for an integrated musical training unites both choirs. The Berlin Girls Choir-Academy shall realise common projects, establish new literature for girls choirs, install a library, push scientific projects and offer further trainings. 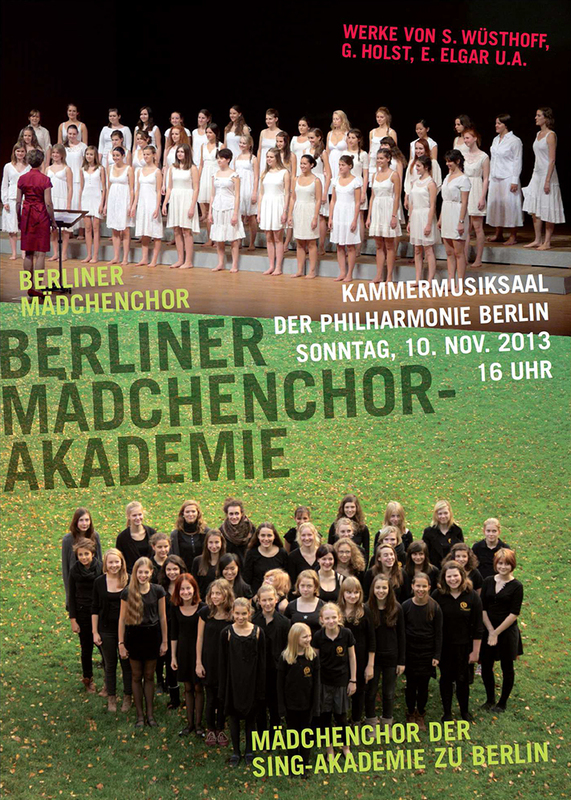 First project: Academy concert on 10 November 2013 in the chamber music hall of the Philharmonie Berlin. The programme consisted of ancient music, romantic, contemporary music as well as the first performance of the “Drei Rosenstücke“ by Sabine Wüsthoff, based on poems by Nikolaus Lenau. The ensemble for girls choir and string orchestra was not commonplace. The concert was preceeded by a week of common rehearsals in spring 2013, a common further training of the conductors in May 2013 and another weekend of common rehearsals in November 2013. Second project: Participation in the concert for the composer Felicitas Kukuck’s 100th birthday at the University of Arts Berlin on 16 November 2014. Both choirs first rehearsed Kukuck’s “Girls Lieder” and “Spiritual Chorals” independently, before they came together for a workshop in which they jointly developed their performance. 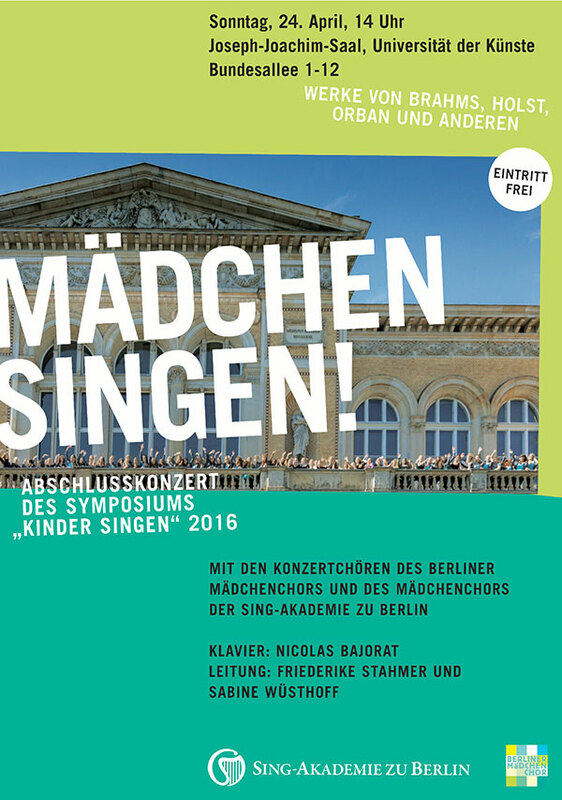 Third project: To celebrate the first ten years of the girls choir of the Sing Academy Berlin and the 30 years of the Berlin Girls Choir in 2016, the symposium of the Berlin childrens choirs of the Berlin Career College of the University of Arts Berlin mainly focussed on the work with girls choirs and voices. Among various speakers there were Prof. Friederike Stahmer and Gudrun Gierzal, girls choir of the Sing Academy Berlin, and also Sabine Wüsthoff, Berlin Girls Choir. In closing of the symposium, both choirs together gave a concert in the Joseph-Joachim-concert hall of the University of Arts. Fourth project – hospitation: Within the scope of the encounter of Albanian choir conductors with the Berlin Girls Choir in autumn 2017 the participants also visited rehearsals of the Girls Choir of the „Sing-Akademie Berlin“. In return Friederike Stahmer and ten students attended on October 12 in rehearsals of the Berlin Gilrs Choir, where they got new inspirations by Sabine Wüsthoff and Eleni Irakleous.